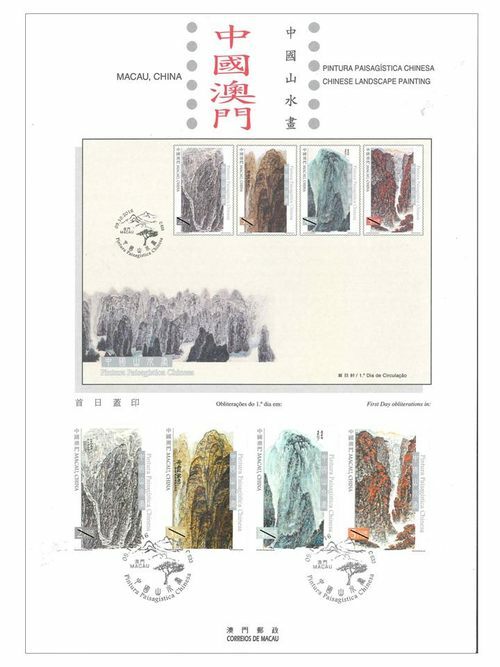 Stamp Issue "Chinese Landscape Painting"
M acao Post will issue the stamp theme “Chinese Landscape Painting” on 9th October, 2016. 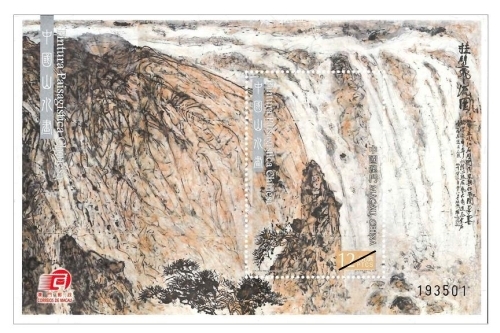 Chinese landscape painting became an independent style in the Sui and Tang Dynasties, and gradually matured during the Five Dynasties and the Northern Song Dynasty. 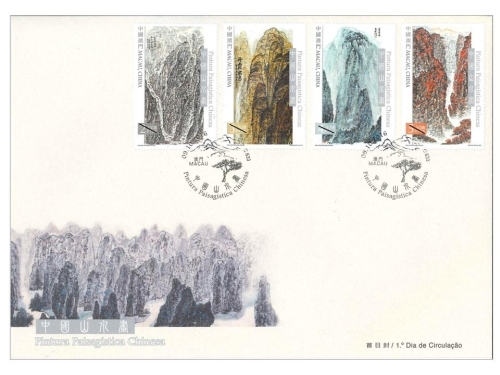 Landscape is endowed with divine characteristics by the Chinese culture, constructing aesthetic connotations of Chinese landscape painting that interpret mountains as the moral conduct and water as the personality, establishing the philosophical ideal that “The great beauty of the universe is silent” in the development of Chinese landscape painting. 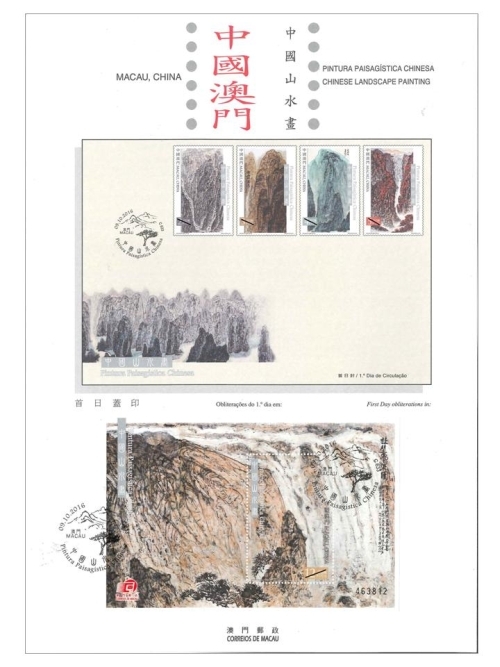 This issue includes a set of four stamps and one souvenir sheet, the landscape paintings depicted on the stamps are selected from more than hundred of paintings created by the Macao painter Sun Jiang Tao, with the theme of “A night of rain at the mountain, cascades from the rocks”, “Autumn of Danxia”, “Verdant Shennongjia”, “Golden Autumn of Xiajiang” and “Waterfalls against the cliffs”. 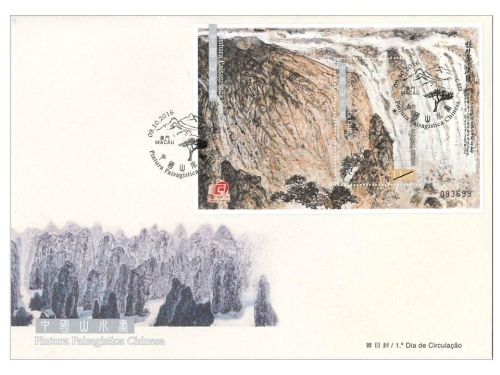 The image illustrates on the first day cover is “Landscape of Guilin”. 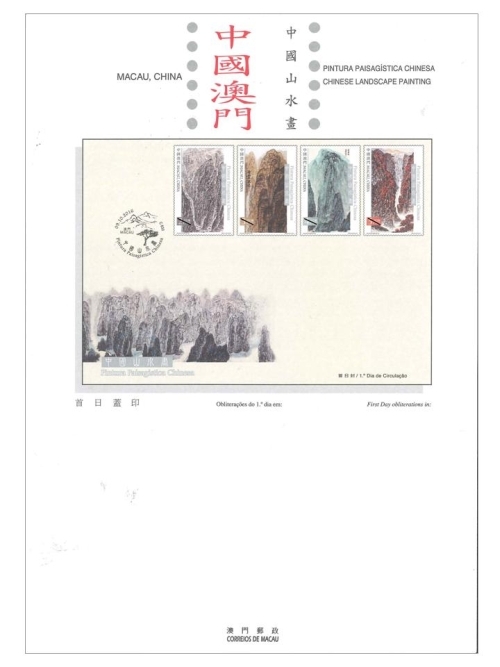 The composition of this issue is designed by Macao Post, and the text of the information brochure is written by Mr. Sun Jiang Tao. This is the twelfth theme in 2016. 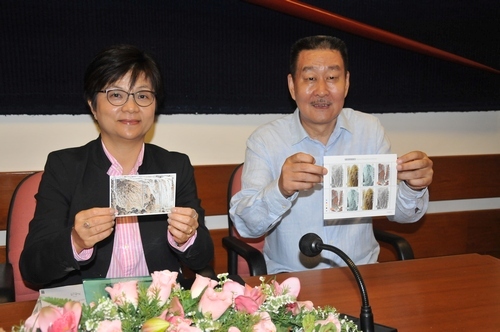 The previous issued stamps are “Lunar Year of the Monkey” on 22/01/2016, the label stamp “Lunar Year of the Monkey” on 22/02/2016, “Scenery of the Imperial Palace in Beijing” on 01/03/2016, “325th Anniversary of the Establishment of the Public Security Police Force” on 14/03/2016, “Chinese Classical Poetry – Ballad of Mulan” on 08/04/2016, “Macao Seen by Chan Chi Vai” on 28/04/2016, “Museums and their Collections V – Maritime Museum” on 18/05/2016, “FIVB Volleyball World Grand PrixTM – Macao 2016” on 17/06/2016, “Mountains and Rivers of the Motherland – Yangtze River” on 11/07/2016, “Games 2016” on 29/07/2016, “Paintings of Macao’s Famous Artists” on 25/08/2016, and “120th Anniversary of the Birth of General Ye Ting” on 10/09/2016 . 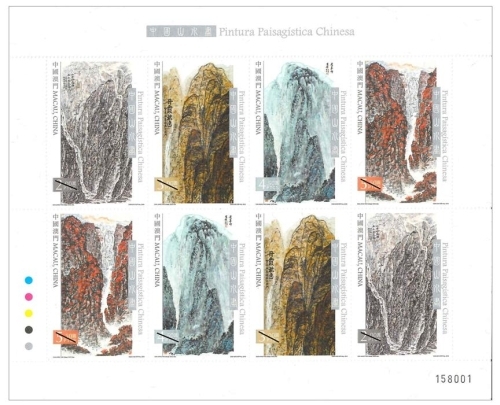 Technical Data of Stamp "CHINESE LANDSCAPE PAINTING"